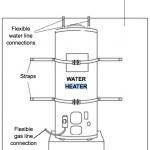 Do You Need A Permit To Install Or Replace An Existing Water Heater? Water Heater Noises: Which Ones Are Serious? Humming, popping, cracking, sizzling, ticking, gurgling and hissing noises occur for different reasons. There are two basic types of water heater vents. Each has a specific method of connection and if not done properly, there can be several problems that develop. The clearance depends on the type of material and if metal, whether its a single wall or dual wall vent. Overly hot water can cause 1st, 2nd and 3rd degree burns when coming out a discharge line. What is considered a safe temperature for your water heater to be set at. Go look at your water heater and see if it is set at a safe temperature. Simple rules to follow when strapping your water heater. Is yours correct? Water heater pans provide protection for the floor but need to have a proper drain hooked to them. The "Leaning Tower of Pisa" is a great attraction, but it's not the case for a leaning water heater. Is it time to switch your furnace gas line? There is a safety concern. Possible corrosiveness or cracking. Water temperature should be under 120 degrees or cooler, should be drained once a year and can explode under some circumstances.